The Vee Bar Guest Ranch is located near the base of the Snowy Range Mountains in southeast Wyoming. The historical lodge was built in 1891 and once served as a stage coach stop, a post office, and a buffalo ranch. The Vee Bar is currently family owned and operated and guests of the ranch experience an authentic Wyoming vacation. The Vee Bar is open year-round. 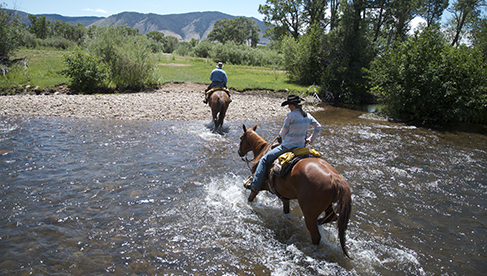 During June, July, and August guests enjoy all-inclusive ranch packages packed with activities ranging from horseback riding to fishing. Three delicious home-cooked meals per day are served. The Vee Bar’s horseback riding program is second to none. You will be matched with one horse for the duration of your stay. The Vee Bar wranglers will work with you to make sure you are comfortable on your horse. Every rider will have the chance to progress as he or she becomes more comfortable on their mount. Riders are not asked to ride in an uninspiring head-to-tail line. Loping rides are offered for those who are interested, and the terrain varies greatly! Rides leave the main barn at the Vee Bar, go through the lush meadows in the river bottom, or up onto high plateaus overlooking the valley, including the Vee Bar Ranch. Later in the week, a few rides start on a neighboring ranch and traverse through more mountainous country. Cattle work is a highlight each week when guests help the wranglers move cattle from one pasture to another, sort, and doctor cattle. All rides are adapted to any level of experience so nobody will miss a thing! This truly will be the Wyoming horseback riding vacation to remember! From September to May, the ranch is open as a bed and breakfast. 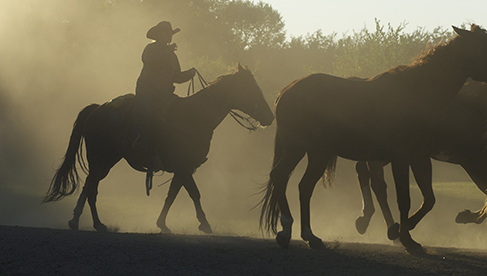 Horseback riding and other activities can be added to a B&B package year-round. 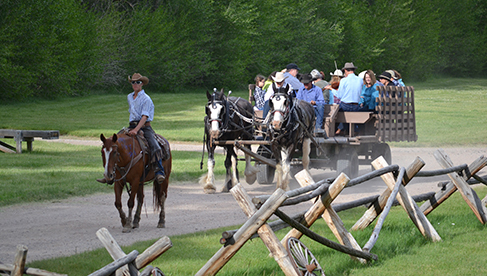 Horse-drawn wagon rides, walking trails around the ranch, an outdoor hot tub, the John Wayne Saloon, horseshoe pits, and archery are a few of the activities that guests can enjoy while visiting the ranch. During the winter months, other popular activities include downhill skiing, cross country skiing, snow shoeing, and sledding. The Vee Bar was listed on the National Register of Historic Places in 1986. 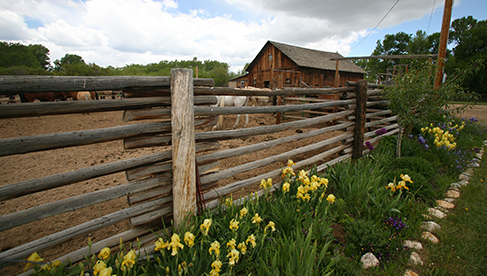 Five historic buildings including the lodge, original corral and a stock chute. Enjoy the Vee Bar in the fall, winter, and spring! 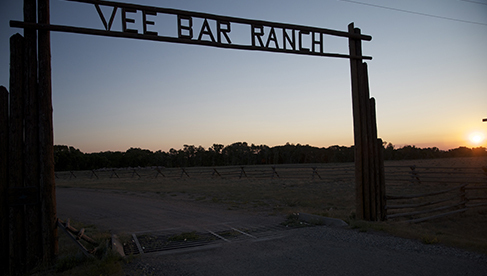 The Vee Bar has been open for bed and breakfast since 1994, but this package allows guests to participate in more activities and meals at the ranch. The Vee Bar staff will make sure that you get the most out of your vacation while exploring the Vee Bar, the Snowy Range Mountains, and local attractions. Guests will need their own transportation to and from some of the activities off property. A three-night minimum stay is required to purchase this package. See our Escape Package Sample Schedule for activity and meal details. Package Includes: lodging, meals, horseback riding, guided hiking/snowshoeing, evening entertainment on select nights, and two free-drink coupons (per person). Prices: $260 per adult (18 and older), per night. See details for exclusions and inclusions. Learn more visiting Vee Bar's website, by emailing the Vee Bar or calling 307-745-7036. Vee Bar Guest Ranch- Ski Packages Are Back–and space is going fast!! Stay at the Vee Bar Guest Ranch, Ski at Snowy Range Ski Area! The Ski N’ Stay bed and breakfast specials are back! It is a deal you won’t be able to beat and an experience you will cherish forever! At the Vee Bar Guest Ranch, a homemade breakfast is included every day! The cabins along the banks of the Little Laramie River are the perfect place to get cozy, read a book, or play board games with other members of your party. After a day of skiing, enjoy the clear Wyoming sky and count stars from the outdoor hot tub. The John Wayne Saloon is the stage for a game of billiards, cards, or board games from our collection. For the non-skiers in your party, or for the days you don’t ski, the Medicine Bow National Forest provides miles and miles of snowshoeing and cross country ski trails. Give our office a call at 800-483-3227 to schedule your winter vacation! See rates and details for the two-day package and three-day package. 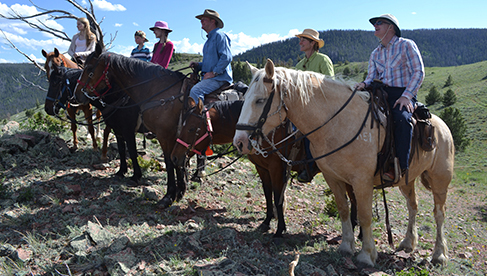 From riding in the meadows to riding across the Snowy Range Mountains in the Medicine Bow National Forest, Vee Bar offers an extensive horseback riding program. Guests age six and up can take lessons and younger kids can take lead-around rides. 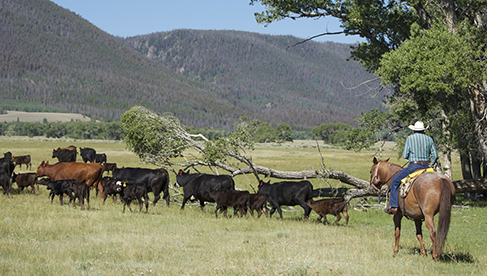 Cattle work is also an option for guests, including team penning and cattle herding. 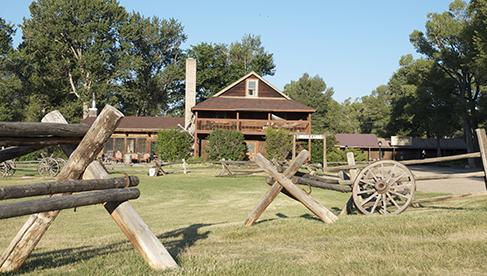 River tubing, fishing, hiking across glaciers, camping out in teepees, walking trails around the ranch, an outdoor hot tub, the John Wayne Saloon, horseshoe pits, roasting marshmallows, learning to rope, playing games, swing dancing, horse-drawn wagon rides, and archery are a few of the activities that guests can enjoy while visiting the ranch. Teens and adults may enjoy fly-fishing demonstrations. Riverside Suites and cabins welcome guests to cozy accommodations. 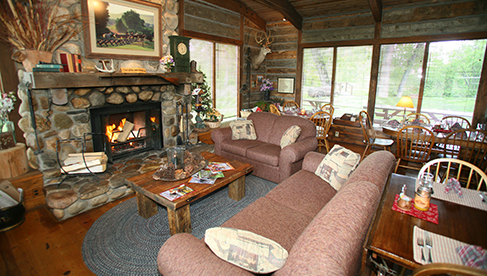 Cabins have decks and chairs for guests to relax and read or spot wildlife, like deer, rabbits, chipmunks and squirrels. The Riverside Suites, located near the lodge & hot tub include two private bedrooms, full bath, small refrigerator, coffee maker, hair dryer. 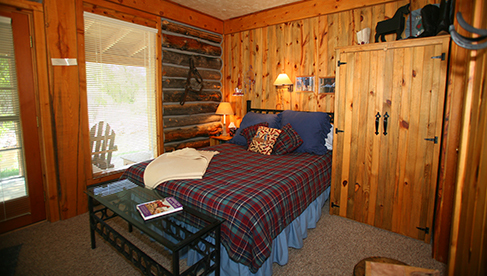 All are within walking distance to the lodge and sit along the banks of the Little Laramie River. See more photos of accommodations. 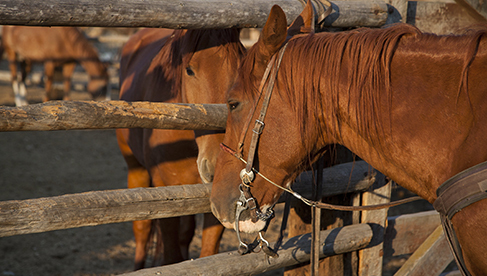 From picnics to BBQ's to buffets, this Wyoming dude ranch offers a variety of culinary delights for guests. Three meals a day are served in the summer. For breakfast, guests enjoy hot coffee or tea, a fresh fruit plate, homemade pastries, and a variety of freshly prepared items from a buffet. Lunch and dinner menus include hearty Western fare and diverse fresh foods, like salads, homemade breads, and desserts accompanying delicious main course choices. The John Wayne Saloon features a variety of sodas, wines, liqueurs and other alcoholic beverages. Special dietary requests can be accommodated with advance notice. 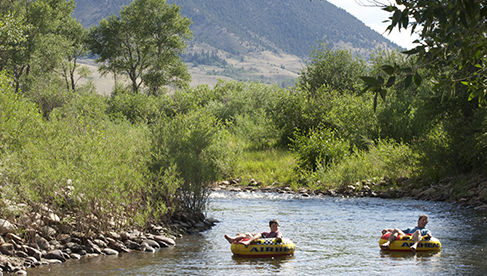 There's a lot to see and do in this part of southeastern Wyoming, an area ideal for outdoor enthusiasts. Enjoy museums, shops and restaurants in Laramie. Go hiking at Vedauwoo or along the Snowy Range Scenic Byway in the Medicine Bow National Forest. 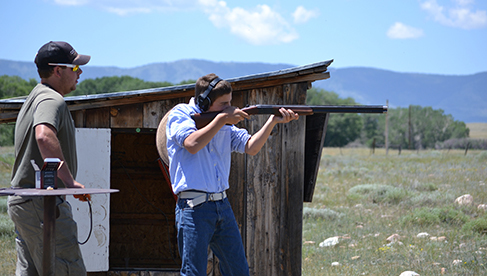 Explore the Wyoming Territorial Prison, Medicine Bow Mountains, Centennial, Encampment and the Grand Encampment Museum, Lake Owen and Saratoga Hot Springs before, after or during your time at the ranch. All-inclusive during the summer; payments are check, cash, and credit cards. See rates and special weeks.